Unsere frisch renovierte Kabine mit zwei Schlafzimmern in Silver Gate, Montana, ist günstig gelegen, um den Yellowstone National Park und die Bear Tooth Mountains zu erreichen. Wir sind vom 1. Juni bis Ende September geöffnet. Es liegt direkt am Soda Butte Creek und nur 1,5 km vom NE-Eingang des Yellowstone National Park entfernt. Die Hütte bietet einen wunderschönen Blick auf die Berge, einen Bach und die zahlreichen Tierarten, die von unserer Terrasse und unserem Garten aus sichtbar sind. Häufige Besucher sind Bären, Rehe, Elche, Bisons, Füchse und Wölfe. Möglichkeiten zum Wandern, Fliegenfischen und Fotografieren gibt es im Überfluss. Reitausflüge und Rafting können auch mit lokalen Führern arrangiert werden. Die Region ist reich an Geschichte, Wildtieren, Fliegenfischen und Wandern. Sie können alles innerhalb einer kurzen Wanderung durch die Vordertür der Hütte erleben und / oder fahren. Silver Gate ist ein perfekter Ausgangspunkt für Ihre Erkundungstouren durch den Yellowstone National Park, die Beartooth und Absaroka Wilderness Gebiete und die große Anzahl an Bergseen, Flüssen, Wasserfällen und Trails in Montana und Wyoming. Für diejenigen, die sich einen etwas vertrauteren Hauch von Zivilisation wünschen, bieten Silver Gate und das nahegelegene Cooke City Restaurants, Einkaufs- und Unterhaltungsmöglichkeiten in den Rocky Mountains. Komplett renoviertes Badezimmer mit begehbarer Dusche. Housekeepers sauber einmal pro Woche, und / oder am Ende jeder Belegung. Der Eigentümer, zusätzliche Reinigung oder Service. Cabin was nice and had everything we needed. Great location to the park. I would definitely stay there again. We are pleased you enjoyed your stay at our cabin. We invite you to visit again. There is much more to see and experience in Yellowstone National Park and in the Bear Tooth Mountains surrounding Silver Gate. Our family of six stayed in the cabin for a week. We visited Yellowstone National Park daily, which is a drive but beautiful! The cabin was well stocked with pantry item basics (Smores supplies, crackers, some cereal), Ziploc bags, Saran wrap, etc. The newly renovated bathroom is fabulous as is the master bedroom with built-ins. Washer and dryer were great to have, laundry detergent was even supplied! Wildlife was abundant around the park and the cabin. We saw a deer one evening next to the cabin and squirrels and birds visited regularly!! It was a nice getaway and we were able to stay "off the grid" for a week! The owners of the cabin were great at communicating and dealt with any issues that arose. Fire pit and deck were great use of outside space. Our boys loved skipping rocks in the stream. Silver Gate residents were so friendly, both stores in town had great souvenirs and treats. Ice cream is great!! I highly recommend!! Best location for exploring northern and eastern parts of the Yellowstone region. Excellent cabin, well stocked and very comfortable. Very accommodating owners. Also, we were not expecting much from Cooke City/Silver Gate but they are fun towns! Thanks for the review. We feel our cabin is in the greatest location also! Glad all that you needed was available and you had a grand time! We truly love and enjoy sharing our special place and cabin. Come back again! A Great Place to Disconnect!! We really enjoyed our stay at the cabin. The cabin was a perfect base for visiting Yellowstone National Park's Lamar Valley. The full kitchen and washer/dryer were really convenient. While it rained every day that we were there, we did get to enjoy the fire pit one night. We also loved the deck overlooking the very full Soda Butte Creek and the wildlife that visited the cabin. The views are amazing. Pros: Spacious for two guests, very nice setting, long-distance calling available to check on our elderly parents each day, no cell service/no television channels/no radio channels and limited wifi (yes, this is a pro, as one visits this area to be close to nature, not technology), being able to borrow bear spray (and not have to use it! ), advice from the owner on likely fishing spots (however, even a bad day fishing is still better than a day at work! ), wildlife nearby, and did I mention the location, location, location!! Suggestions: a hair dryer for guests who are traveling by plane with minimal suitcase space, a little gravel on the parking spot (it was rainy every day of our stay), and the front lock is a little tricky and might be in need of maintenance. For future guests, bring groceries with you upon arrival. Nearest major grocery store is an hour and a half to two hours and may require travel through the park. Overall, we hope to come back to this same cabin next year (maybe the weather will be a little more cooperative, however snow in June was a reprieve from the 90 degree heat at home). The owners are very hospitable and checked to make sure we arrived and found the cabin in satisfactory condition. The new renovations are very nice, loved the tongue and groove ceilings in the bedroom and bath, and especially liked the bathroom renovation. Thanks so much Gary and Terri for making this a wonderful, relaxing vacation! We hope to return next year! 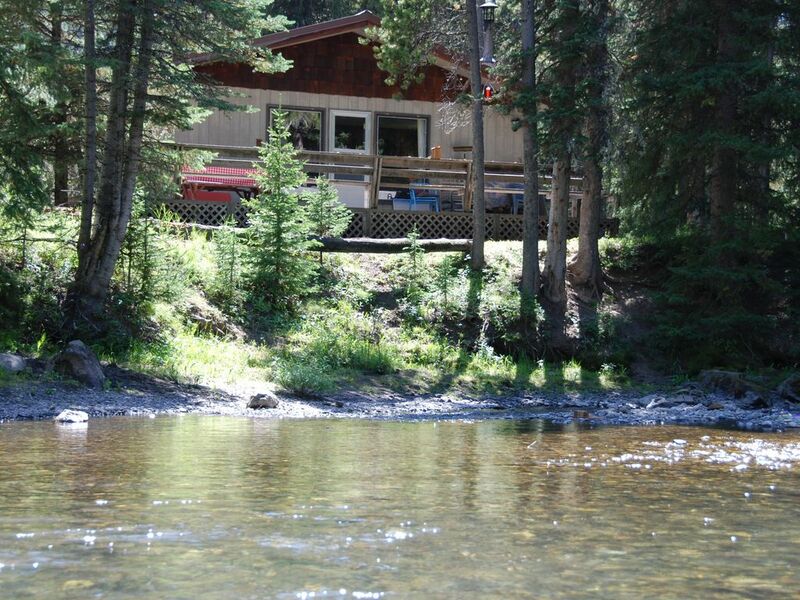 This creekside cabin was a perfect place for my family of six to stay while visiting Yellowstone Park. It was thoughtfully decorated and we loved the bedroom/bathroom layouts. The kitchen was stocked well with the cooking essentials so I was able to cook breakfast and dinner for my family easily. We enjoyed a few home cooked meals and all agreed the beautiful views of creek and mountains were better than any restaurant in the world could offer us. The fire pit was a great joy to my kids. We explored Silver Gate a bit but would love a chance to stay at the cabin and not run off into Yellowstone Park in the future. It was an easy place to feel at peace. Thanks for renting and we get great joy that you feel the same about our cabin as we do!! Your time together as a family and enjoying the mountains, the fire pit and feeling peace is what it is all about! You were great people to have also. Hope you can come back! We chose this cabin due to the location in Silver Gate. Our main "mission" was to experience Yellowstone, especially the northern, wildlife-filled part. We were stunned by the beauty and serenity surrounding the property. The cabin was very nice and, although there were only two of us, I imagine a family could stay very comfortably. We packed as much into our days as we could and were always glad to get back to the cabin to grill out, feed the birds, and relax on the deck. Even though it is in an area with other cabins, it is private, secluded, and within about a mile of the NE entrance to Yellowstone. During our stay, we wanted for nothing and will definitely be back! We saw three moose at once in the backyard one morning. During our week, we saw more than I ever dreamt possible (mostly in Lamar Valley), including: grizzly bears, black bears, wolves, moose, pronghorns, bighorn sheep, mountain goats, deer, elk, and, of course, bison. Favorite sighting: grizzly bear and cubs chasing a wolf away from a fresh elk kill, unbelievable! Thanks so much for being part of the experience of a lifetime! Vierräder nur in geschrieben Bereichen erlaubt.